Pay As You Go subscribers can select one of the below Mobile Internet plans or choose any of the Data Top-up cards as described below, which are available at your local kiosks or through our website online. You just select the duration you need and send the corresponding sms to 8133. Select the duration you need and send the corresponding sms to 8133. You will then receive a text informing you that the pay as you go Mobile Internet Plan you requested has been added to your account. 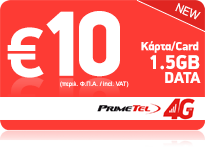 In the event you exceed the limit of MB which is included in the package or its date validity period has passed, standard charges will apply for Mobile Internet, €0.25/MB charged per ΚΒ. APN (access point name): ip.primetel. 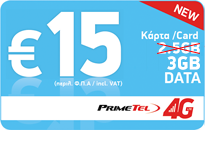 “Username” και “password” παραμένουν κενά.